Tales of lost gold told by early prospectors and adventure seekers have found a large audience here in Southern California. Some of the stories have been past down, mapped, been retold and then kept alive by the likes of now defunct Desert Magazine. During the 60s and 70s articles of lost treasure appeared in almost every monthly issue of the magazine. These gems of desert lore invariably brought letters to the editor questioning, confirming or adding to the stories. Heck, it was all in fun, and I for one wish that the likes of then editor Jack Pepper and his publications were still around to keep us pumped with revelations about the California desert. While working at a spring in the Clipper Mountains, he noted a faint trace of a path leading off to the side of the mountain and so he decided to follow and see were it would lead. After hiking some distance, he came upon a recently abandoned camp site that had all the trappings of a miner’s camp. Continuing up a steep bank and scaling across the edge of a narrow shale wall he arrived at a mine shaft of some depth with sides well boarded up by old railroad ties. His prospector instincts told him that the ore, on the tailing pile next to the shaft, looked exceedingly rich. However, it was getting on in the afternoon and so he decided to stay the night at the small miner’s camp below. In the morning, he happened to kick the lid off of an old Dutch oven located near the fire pit and from that old pot gold ore “rich-to-the-eye” spilt out onto the ground. Well, as would happen, he found that he was out of water and must therefore leave immediately. So, filling his pockets with as many pieces of ore as his pockets would hold he headed down the mountain. Tom wasted no time and soon had his ore samples taken to Los Angeles and tested. The assay showed that the ore, found in the old Dutch oven, had very high gold content. Indeed, Tom Schofield was about to become a very rich man; but, first he must hurry back to the Clipper Mountains and mark his claim to the mine. He search throughout the high canyons of the Clipper Mountains for many months but was unable to relocate the camp or the mine. Years passed and the story, retold and written about many times, became known as the “Lost Dutch Oven Mine” and is often confused with the Lost Dutchman Mine of the Superstition Mountains of Arizona. In the early 1890s, young Tom Schofield was hired by the Santa Fe Railroad to locate water sources along the right-of-way running west from Needles. In those days, locomotives ran on steam power and the boilers had to be refilled with water at stations located along the rails. 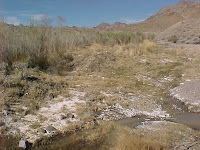 The spring, mentioned in his lost mine story, is located in the Clipper Mountains at a place now named Bonanza Spring. Water from the spring was claimed by the Southern Pacific Railroad in 1893. The company connected the spring to the water tanks at the Danby Station with a four inch pipe running from a 350 foot tunnel blasted directly into the side of the mountain above. This spring provided water to the railroad for almost 40 years before being replaced in the 1930s by a well located near the Station. After his hitch with the railroad, Tom Schofield spent most of his time prospecting for gold in the Old Woman and Turtle Mountains, for salt in Danby Dry Lake, for iron ore in the Marble Mountains and probably at may other locations between Essex and Amboy. 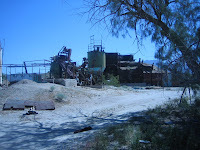 At one time, he held an interest in the Iron Hat Mine located about twelve miles east of Amboy in the Marble Mountains. The mine (1926 photograph below) became active sometime after W orld War I and lasted only a few years. There were two tunnels with cross-cuts that yielded over 2,000 tons of ore during operations. Tom was reported to be living near Amboy at the time. He didn’t leave a diary so most of what we know about him comes from public records and accounts given by folks who knew him. He was well liked and generous to a fault. He drank whiskey and frequented local saloons as most miners did when not working their claims. He regularly registered to vote from 1900 to 1936.and was living in Chambless in 1940. Some say he lived to be over 100. In his later years, when asked about his lost mine he would pass it off and simply say, “there’s plenty of minerals out there for everyone”. Incidentally, Bonanza Spring is a great place to visit if you have a high centered vehicle. The water pipe was scrapped for military use during WWII. And after the war, a few squatter’s built shanties along the stream. One fellow brought in some earth moving equipment and scraped out a pool of some length and allowed the locals to drive up and take a swim. Living was good and rent was free -- there was only one problem, the land belongs to the U.S. Government and these desert dwellers were eventually judged to be in trespass. The land is managed by the BLM and it took some time for the agency to evict these folks, clear the area of old car bodies, piles of junk and demolished shelters. BLM recently graded a parking area and built some picnic tables. The spring is an outstanding example of a “desert watering hole” and is a good place to start a hike into the Clipper Mountain Wilderness Area. The road up to the site is a little rough and access from the highway is not marked. Best to check Google Earth at 34 41.196 115 24.318 ahead of time. The Danby Station is located about 1.6 miles southeast of Highway 66 on Danby Road. A post office was established here in 1893 and served as the mail drop for mines in the Old Woman Mountains until it was closed in 1913. It would take some archeology to figure out what all was here during that period. The mill located to your right as you cross the tracks was active some time around or during the 1960s. Prior to completion of Interstate Highway 40, a few service stations and an eating place opened near the intersection of Danby Road and Highway 66. And what about the Lost Dutch Oven Mine? It’s my guess that Tom Schofield never intended for his tale to be bought by so many weekend treasure hunters. But on the other hand, it brought a lot of visitors to his door and I am sure that this made his retirement years interesting.